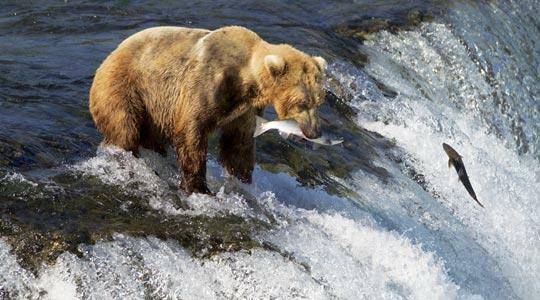 A grizzly bear catching salmon at Brooks falls, Katmai National Park, Alaska. Climate change is pushing Arctic mammals to mate with cousin species, in a trend that could be pushing the polar bear and other iconic animals towards extinction, biologists said yesterday. “Rapidly melting Arctic sea ice imperils species through interbreeding as well as through habitat loss,” they said in a commentary appearing in the British science journal Nature. In 2006, they said, scientists were startled to discover a “pizzly,” or a hybrid of a grizzly bear and a polar bear, and in 2010, another bear shot dead by a hunter also was found to have mixed DNA. Global warming has hit the Arctic region two or three times harder than other parts of the planet, redesigning the environment in which dozens of terrestrial and marine mammals live. In particular, the shrinking of the Arctic ice cap – set to disappear in summer by century’s end without a deep cut in greenhouse gas emissions – has pushed polar bears outside their normal hunting grounds. The fierce predators use the edge of the ice cap as a staging area to stalk seals, their preferred food. How far Arctic species have intermingled is unclear, although some important examples abound, according to the article, lead-authored by Brendan Kelly of the US National Oceanic and Atmospheric Administration. Last year what appeared to be cross between a bowhead and a right whale was photographed in the Bering Sea between Alaska and Russia. There are fewer than 200 North Pacific right whales left, and the far more numerous bowhead could, through interbreeding, quickly push this remnant population to extinction, the researchers warned. Different species of Arctic porpoises and seals are also known to have produced offspring with a mixed bag of chromosomes. Hybridisation is not necessarily a bad thing in itself, and has been a key driver of evolution, Mr Kelly said. But when it is caused by human activities, the phenomenon tends to occur over a short period, which leads to a ­damaging drop in genetic diversity. When mallard ducks were introduced to New Zealand in the late 19th century, for ­example, they mated with native grey ducks. Today, there are few, if any, pure grey ducks left. In the case of “pizzlies,” the mixed heritage poses a survival risk: While showing the polar bear’s instinct for hunting seals, one such hybrid has the ­morphology of a grizzly, which is poorly adapted to swimming. Mr Kelly’s team recommended culling hybrid species when possible, as has been done for the offspring of red wolves and coyotes in the US. They also pointed out that sharply reducing the amount of carbon dioxide (CO2) pumped into the atmosphere will help slow the disappearance of the Arctic ice cap.